I’ll admit it, since I’ve come back to America I’ve been on a packaged vegan foods spree. Usually I aim to eat mostly food I cook myself and a lot more vegetables, but I had a bad case of mono for a bit over a month so I got a little lazy. Plus, there’s a new Whole Foods near my house and so it’s the first time I’ve had access to products like Gardein, Daiya and Dandies! I got a little excited, but I’m on my way back to normal. The Crispy Tenders are my favorite and remind me of my childhood love for fast food chicken nuggets (no wonder I was a fattie), except I like to think they’re at least somewhat healthier since they’ve never touched any surface of McDonalds and are made of grains, soy and pea protein instead of questionable hormone-filled chicken. The main downfall of the Gardein products is the price. Usually they’re between $4-5 for 2 servings in a bag, which is a bit steep for me. Coupons pop up once and a while, but the price is the one thing that keeps me from buying them more often. 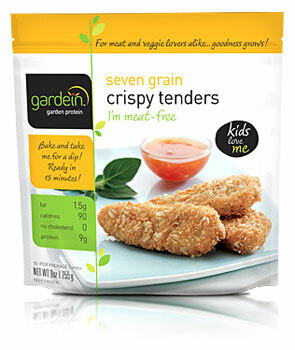 gardein™ chick’n: water, soy protein, vital wheat gluten, ancient grains (quinoa, amaranth, millet and kamut®), natural flavors (from plant sources), potato starch, expeller pressed canola oil and/or safflower oil, pea protein, modified vegetable gum, carrot fiber, organic beet root fiber, organic evaporated cane juice, yeast extract, sea salt. seven grain breading: water, modified cornstarch, toasted wheat crumbs, wheat flour, onion powder, soy lecithin, spice, corn flour, baking powder, guar gum, rice flour, oat bran, oats, quinoa flour, amaranth flour, millet flour, kamut®. Keimling Naturkost Raw Food Products Delivery!